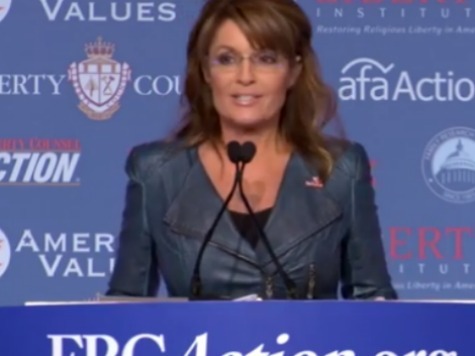 WASHINGTON–The Family Research Council held its annual Values Voter Summit in Washington, D.C. this weekend, and the woman who embodies those values as well as anyone delivered a well received speech Friday to an adoring crowd. Former Alaska Governor Sarah Palin’s remarks included humor, a no-holds-barred critique of President Barack Obama, and plenty of red meat. But most of all her message was one of optimism and hope, from start to finish. She started by rallying her fellow conservatives and ended by painting a bright picture of the future. In between, those in attendance at the Omni Shoreham Hotel were treated to inspiring words from the darling of the Tea Party movement. With the end of the Obama administration in sight, Palin was able to point toward a light at the end of the tunnel. The huge ovations, laughter, applause and smiles proved those on hand liked what they heard, a lot. None of Obama’s pie in the sky, smoke and mirrors promises came true. Although he’s certainly tried to sink every putt, no matter what real issues are affecting our country. Palin addressed those issues in a thoughtful manner while calling on Americans to stick to their traditional values. The audience clearly enjoyed Palin’s style. Joking about very serious issues to drive home vital points. That’s exactly what makes Palin Palin. In a day and age when we are inundated with teleprompter-reading academic milquetoasts, Palin’s brand of populism is a welcome relief. After all of the hits Palin has taken over the years she still can knock lines like this out of the park with a huge smile on her face. It drives liberals nuts. It delighted those at the summit on Friday. Palin called out liberals for their tactics of hate. She called those who question why she sometimes doesn’t wear a wedding ring “haters” and intolerant.” We all know media members and politicians engage in these gutter tactics. Few however have the guts to call them out so explicitly like Palin does. Then Palin posed a simple question. “Do you think it’s time to abolish the IRS?” The crowd went into a frenzy. Unlike so many in Washington, Palin recognizes our rights come from our creator and not from bureaucrats with an agenda. “Because it’s an inherent, God-given passion and a need to be free, Palin stated. “He created us with that drive to be free. And, friends, we in this room — we know it. We live it. We are the liberty movement. We the people — you — men and women serving in the military — and look at the representation of our military here in this room — you have secured the movement that liberates all United States citizens to dream and to think and to believe and to do, and God put dreams in you. You’ve got to get them. That’s how you live life vibrantly with no regrets. During the speech, Palin inadvertently referred to the White House address as 1400 Pennsylvania Avenue instead of 1600. Despite all of the important fact-filled components of her remarks the media blew that minor faux pas up, passing over her message of hope and traditional values to try to once again slam their favorite Alaskan target. Palin told values voters that they are winning and that they can and will continue to win. Palin’s tremendous speech and her constant mastery of dealing with the delusional Left through social media shows she is indeed winning as well.